We have a few really good Homemade Gifts In a Jar Ideas for Christmas! We love homemade items and we have plenty of ideas to get your creativity going. One of our most popular homemade gift ideas for Christmas is our own copycat recipe of Mary Kay’s Satin Hands. This stuff is amazing and it makes your hands super soft. Everyone loves it! 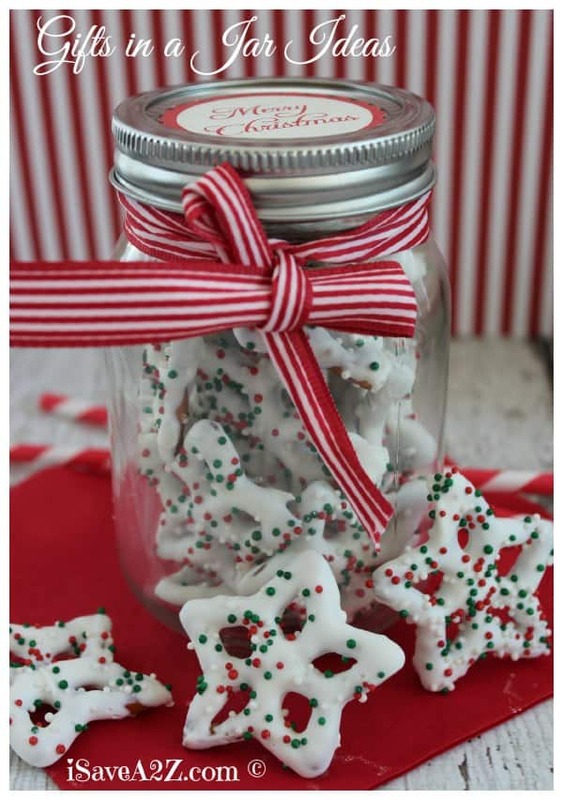 We have a few edible gifts in a jar for those that like snack ideas. We love mason jar gifts. (although the wide mouth small mason jars can be a bit hard to find so we tend to always order those online) They are so stinkin’ adorable when you decorate them up too. We always add a label on top and a decorative ribbon to the jar to complete the gift! This decorative twine is our favorite that goes with almost any holiday too. Heat white candy chips in small Bowl by microwaving for 30 seconds stirring and repeating until melted. Allow to cool for 2-3 minutes. 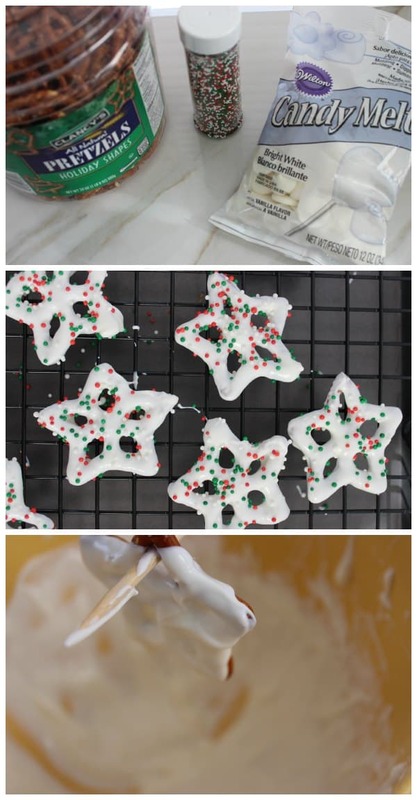 Dip Pretzels in white chocolate to cover completely and place on cooling rack sprinkle with decorations. Allow to set before placing in jar. I love easy gift ideas but mostly everyone loves the edible ones too. Grab our Free Printable Label here! If you need other ideas for Unique Handmade Christmas Gifts, we have plenty! All of our Sugar Scrub recipes are extremely popular and worth trying! By Jennifer on December 18, 2013 Desserts, Recipes.